582 pages | 11 Color Illus. | 26 B/W Illus. 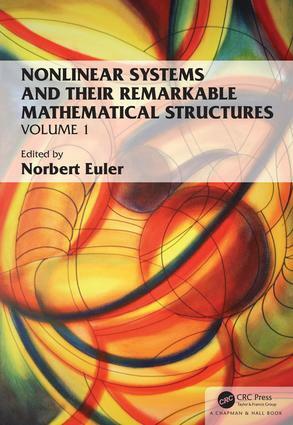 Nonlinear Systems and Their Remarkable Mathematical Structures aims to describe the recent progress in nonlinear differential equations and nonlinear dynamical systems (both continuous and discrete). Written by experts, each chapter is self-contained and aims to clearly illustrate some of the mathematical theories of nonlinear systems. The book should be suitable for some graduate and postgraduate students in mathematics, the natural sciences, and engineering sciences, as well as for researchers (both pure and applied) interested in nonlinear systems. The common theme throughout the book is on solvable and integrable nonlinear systems of equations and methods/theories that can be applied to analyze those systems. Some applications are also discussed. The theory of integrable systems studies remarkable equations of mathematical physics which are, in a sense, exactly solvable and possess regular behaviour. Such equations play a fundamental role in applications by providing approximations to various (non-integrable) physical models. Dating back to Newton, Euler and Jacobi, the theory of integrable systems plays nowadays a unifying role in mathematics bringing together algebra, geometry and analysis. This volume is a collection of invited contributions written by leading experts in the area of integrable dynamical systems and their applications. The content covers a wide range of topics, both classical and relatively recent. It provides a valuable source of information for both experts and the beginners. Various combinations of sections of the book would make excellent self-contained lecture courses. This book will certainly be a valuable asset to any University library. Written by highly established and actively working researchers, it is quite unique in style due to the breath of the material covered. It will remain a valuable source of information for years to come. 1. On the old problem of the integrability of nonlinear PDEs defined on half-lines by Fokas and Pelloni. 2. On the exact superposition formulae in bilinear form, ready for use, for the construction of sequences of exact solutions of many integrable nonlinear equations by Hu. 3. On the construction of nonlocal recursion operators for local symmetries of supersymmetric nonlinear equations by Kiselev, Krutov and Wolf. 4. On the role of nonlinearity in geostrophic ocean flow and its practical consequences by Constantin and Johnson. Norbert Euler is a professor of mathematics at Luleå University of Technology in Sweden. He is teaching a wide variety of mathematics courses at both the undergraduate and postgraduate level and has done so at several universities worldwide for more than 25 years. He is an active researcher and has to date published over 70 peer reviewed research articles in the subject of nonlinear systems and he is a co-author of several books. He is also involved in editorial work for some international journals, and he is the Editor-in-Chief of the Journal of Nonlinear Mathematical Physics since 1997.